The white RS500i 5.25" Coaxial Open-Ceiling Speaker from SoundTube Entertainment comes in a pair. They are two-way ported speakers with an open-ceiling enclosure design that delivers effective low-end response (from 61 Hz to 22 kHz at -10 dB). The BroadBeam technology in these speakers incorporates a high-frequency waveguide mated to a 1" convex titanium tweeter. The BroadBeam high-frequency waveguide delivers a consistent dispersion pattern across the operating bandwidth that offers optimum edge-to-edge coverage and reduced power needs. Each RS500i speaker incorporates a low-profile grille, motor-board, and a six-position tap switch with transformer bypass position. They feature a SpeedClamp self-locking cable grip for fast, easy, and secure installation. Designed for indoor and outdoor background to foreground SPL applications, each speaker includes a single-point mounting system for rapid open-ceiling installations. 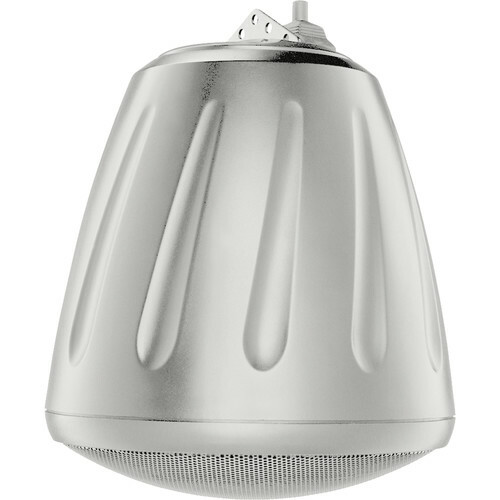 The broad dispersion pattern of 105° and high sensitivity of 86.5 dB 1W/1m makes these speakers suitable for music and paging applications in retail, grocery stores, restaurants, hotels, casinos, museums, trade shows, and conference rooms. Frequency response is measured in half and full space and includes a low-frequency peak >3 dB. Maximum program power is 3 dB above maximum continuous power. Continuous power rating, EIA-426-B test. UL testing specifies band-limited pink noise over the indicated frequency spectrum. Maximum output based on maximum continuous power. Box Dimensions (LxWxH) 15.0 x 12.0 x 12.0"